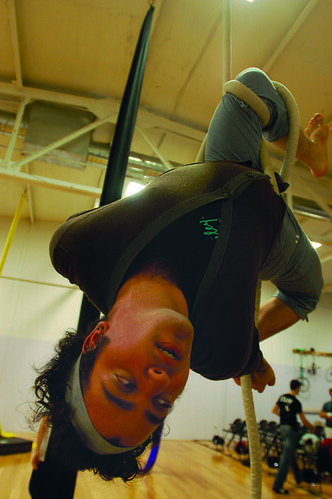 T Lawrence-Simon swings on the ropes at the Philadelphia Circus School. Simon plans on joining a theatrical circus company after he graduates (Julia Wilkinson/TTN). T Lawrence-Simon is graduating in December, but he probably won’t be looking for a new leather briefcase anytime soon. Lawrence-Simon, a senior theater major concentrating in stage management and light design, is a student-teacher and a solo performer at the Philadelphia Circus School, where he’s trained for two-and-a-half years. With aspirations to one day join a theatrical circus company, Lawrence-Simon is among the fraction of this year’s Temple graduates who will be sending out their résumés with job applications and crossing their fingers come graduation. Lawrence-Simon, who specializes in the rope and the hoop, will also be tested within his field of performance art before he can fulfill his dream. This winter, he’ll audition for approximately six different professional circus schools, which he likened to graduate schools for aspiring circus performers. “At most schools, you pick one or two apparatuses or disciplines, and after that, you spend your time mastering that apparatus,” Lawrence-Simon said. Lawrence-Simon has been seriously interested in a career within the circus arts since high school. He said it’s a goal he’s had since he was “a little kid” but didn’t realize it was an attainable one. “I just thought other people knew how to do it, and I didn’t,” he said. But Lawrence-Simon wasn’t the only one who came to realize his passion later in life. Ryan McCool, a senior political science major, graduates May 14. Eighteen days later, McCool commissions as a 2nd Lieutenant in the United States Marine Corps. On June 29, McCool will be sent to the Basic School in Quantico, Va. for six months of training, where “newly commissioned 2nd Lieutenants learn the art of leading Marines,” he said. While job security wasn’t a factor in his decision to join the Marine Corps, McCool said he’s thankful he’ll have a job. Senior geology major Alexander Gibbs came to Temple four years ago with plans to enter the world of engineering after graduation. But this August, Gibbs will begin a six-year formation program at Saint Charles Borromeo Seminary in Wynnewood, Pa.
“Once I become a priest, I will have a 100 percent employment. However, that is still six years away,” Gibbs said. After an in-depth application process that began at the end of the Fall 2008 semester, Gibbs received news that he’d been accepted to the program only a little more than two weeks ago. “I had this image of a priest or a monk walking with God,” he said. McCool seemed to have experienced a different sort of calling — one to serve his country — but was unable to act on that calling until now. After he completes his training, McCool said he is committed to four years of active duty and four years of inactive reserve. Chelsea Calhoun can be reached at chelsea.calhoun@temple.edu. This is very interesting article, however being a current military officer serving in Iraq and a of course a proud Temple Alumni, it was somewhat insulting to call LT McCool’s profession ‘odd’ under the article’s title. It will be an extremely rewarding profession and something that this country needs during these times. Plus, its pays damn well. Congratulation to the class of 2009 and again Congratulation to LT McCool.